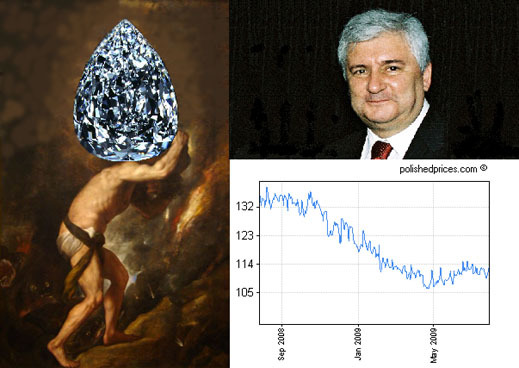 Pressure on the new head of Alrosa, Fyodor Andreyev, to boost rough diamond sales by discounting the price made a prompt appearance in the Russian press — within hours of Andreyev taking his seat on July 15. “The new president of Alrosa has decided to increase sales using discounts”, claimed an anonymous source “close to Alrosa’s supervisory board”, and reported by a Moscow newspaper last week. “A change of marketing policy is being discussed”, the newspaper reported an unnamed representative of the Ministry of Finance as saying — without giving details. Another Russian press agency has claimed that Alrosa plans to reopen its selling window, closed since December, with a $50 million contract, and with a target of $2 billion worth of sales for the full year. Because Alrosa has been selling its output this year only to the state stockpile agency Gokhran, and the undisclosed pricing formula and terms may allow resale by Alrosa if the international market revives, there is no telling what the published $2 billion estimate means, either in terms of resale from Gokhran stocks, or direct sale to domestic cutters and international buyers. For the time being, Andreyev is making no public statements or commitments. Sources close to Alrosa say that Sergei Uhlin (pictured), one of the longest serving veterans in the company, will continue to head marketing, strategy and sales. There is uncertainty about the role to be played by Vladlen Nogovitsyn, whom ex-CEO Sergei Vybornov recalled hurriedly from Hong Kong, and appointed just before his own exit from the company. A well-known Russian diamond manufacturer told PolishedPrices.com that he expects Andreyev to resolve the market uncertainty quite quickly. He said he doubts the reports and gossip that Vybornov had been replaced because of his resistance to lowering the price of Alrosa stones. There were other reasons for his ouster, the source intimated. Separately, Valery Morozov, the head of Ruis Diamonds, Lev Leviev’s Moscow manufacturer, told PolishedPrices.com: “we are ready to buy diamonds for $10 million per month, but the price should correspond to the market realities.” A source at Kristall, the largest of the Russian manufacturers, told PolishedPrices.com that the pricing formula Vybornov had been proposing before his departure — the Ministry of Finance price-book plus 17% — was impossible for cutters to accept, but that if the price came down, Kristall would be ready to buy. before last year’s crash, Kristall and Ruis accounted for most of Alrosa’s domestic sales, and up to a third of all sales.